Getting a lot of junk email? I sure did, hundreds a day. That was because my old email address was written in plain HTML code on my web site, and email-harvesting robots crawl the web looking for exposed addresses. I'm now using a format that can't be read by the harvesting bots. Click the above link to send me a secure email. Thanks! Copyright © 1999 - 2015 Vicki of Vermont. 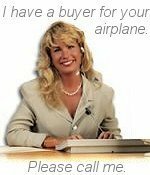 By using this site you agree to hold Vicki of Vermont, principals and agents, harmless from any claim or action you may have in the event of a dispute with any other party involved in the purchase or sale of an aircraft. Specifications are based upon owner's representations, and are subject to buyer's verification. Aircraft are subject to prior sale or removal from market. Registration numbers on photos may be altered or removed to protect the privacy of the owner, and to ensure that buyers will work with us to complete the purchase.